1) How has the work of digital public history changed over time? There is a great deal of experimentation in this phase. Examples include crowdsourcing, full-text, digitized images, zoom in/out functions, audio, apps, and a variety of organizational tools through which to view and present digitized historical materials. The scope of each of the three projects surveyed was different. Two focus on specific events, i.e. Chicago Fire and NYC blackouts, while the other focuses on a specific topic, i.e. Af. Am. pamphlets from turn of the twentieth century (Progress of a People). All three are appropriately narrow in scope, but each builds out and has updated (or not) differently. The NYC Blackout Project site looks like it hasn’t been updated since 1998 and the Chicago Fire & Web of Memory site perhaps needs to be reorganized completely after growing online for nearly twenty years. A definite move to use java/flash was evident from 2002-2009 digital public history projects. Sources are presented in a more visual and interactive way, but formatting and navigation is intended for desktop users. These projects are based on larger events and seem to focus on the notion that we should “complicate” history. This is part of the larger effort to move beyond the typical characters studied in U.S. history and American culture. This trend to uncover troubling parts of our historical narrative are equally, if not more, important. Projects during this phase include: Slavery in New York, Raid on Deerfield, A More Perfect Union: Japanese Americans and the U.S., and Jasenovac: Holocaust Era in Croatia. More recent digital public history projects are less about presentation of a set or distinct group of materials with a somewhat prescribed lesson or learned outcome and more about engagement through contribution and feeling invested in the project. Formatting also move past java and flash and is friendlier for different sizes and types of screens. These project are much, much bigger — tackling millions of pages or sources rather than presenting a thematic “online” exhibit or digital project. This phase shows that digital projects are fluid rather than final. Examples include: Lincoln at 200, Bracero History Archive, Manifold Greatness: Creation and Afterlife of the King James Bible, and Operation War Diary. 2) What should qualities we be looking for as markers of good digital public history work? The qualities of good digital public history are in many ways the qualities of two complementary goals of historians more generally: effective teaching using primary sources and student engagement leading to a deeper understanding of history. This involves the organization and presentation of primary source materials in a way that encourages students and the general public to become “detectives” and to think critically and historically about primary sources as well as context, subtext, and significance. For more see Sam Wineburg’s “Thinking Like a Historian” (TPS Quarterly). 3) What are promising new directions in this field? Promising new directions in the field of Digital Public History include more clearly delineated categories for the projects themselves. Several categories have emerged and include: teaching resource, virtual tour or exhibit, archival body of sources, digitized sets of data, and blog/essay. Another promising development is the more reliable and sustainable use of open-source technology rather than plug-in or software based projects that can limit the user experience. Crowdsourcing projects or creating large digital collections should be wary of data-entry inconsistencies and should clearly identify the purpose and potential use of the sources being digitized. Conversely, digital projects aimed at K-12 learning should be careful not to be too limited in scope. As a whole, Digital Public History remains a dynamic field, full of possibility, and intentionally wide-ranging. Whose Public? Whose History? What is the Goal of Public History? Ron Grele poses three important questions in “Whose Public? Whose History? What is the Goal of Public History?” While this article, written in 1981, does not address the digital methods that have changed the look, feel, and reach of Public History–it is worth noting that the basic purpose and audiences have remained the same. The question of “Whose Public?” aims at defining audience. I believe my role as an archivist and author is connected to several audiences: those engaged in the southern history, urban development, and higher education; undergraduate students at Belmont; student and alumni at Harpeth Hall; and local historians and preservationists. The digital element connected to Public History is now more important than ever. To answer the question of “What is the Goal of Public History?” is a broad question, one that has caused more disagreement than agreement within academia. John Dichtl and Robert B. Townsend surveyed nearly 3,000 professionals in history-related fields. One respondent commented, “A historian is a historian whether working in government, academia, or private industry.” Denise Meringolo suggests that public historians are a unique breed, perhaps the “little sister” of academic history with a different set of tools and intended outcomes. For me, the goal of Public History remains three-fold: to engage, educate, and disseminate history to the general public, to students and colleagues, and to the local community. Despite differences of opinion in regard to the scope and purpose of Public History (in our module readings), this simplistic statement drives my basic understanding of the field which, in turn, fuels my interest in Digital Public History. John Dichtl and Robert B. Townsen, “A Picture of Public History: Preliminary Results from the 2008 Survey of Public History Professionals,” Perspectives in American History (September 2009). The article is available online at https://www.historians.org/publications-and-directories/perspectives-on-history/september-2009/a-picture-of-public-history. 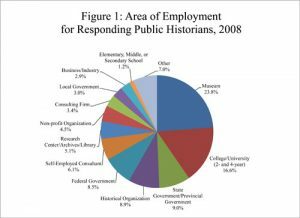 Lawrence B. de Graaf et al, Survey of the Historical Profession: Public Historians, 1980–81 (Washington, D.C.: American Historical Association, 1981). The report is available online at http://www.historians.org/info/SurveyofProfession_Public_80_81.pdf. Ronald Grele “Whose Public? Whose History? What is the Goal of Public History?” The Public Historian 3.1 (Winter 1981): 40-48. Denise D. Meringolo, Museums, Monuments, and National Parks: Toward a New Genealogy of Public History (Amherst: University of Massachusetts Press, 2012). Hello HIST694! I am excited for this course and post this entry as an introduction. Interestingly, I was recently asked to update my biography for Belmont University, where I serve as an adjunct professor. Here is an excerpt that provides some background information about my professional work and interests. In addition, she is a teaching faculty member and the school archivist at the Harpeth Hall School, which celebrates a shared history with Belmont University from 1913 to 1951 as Ward-Belmont. This shared history was part of a recent book, Girls Education from Ward Seminary to Harpeth Hall, 1865 to 2015. Dr. Pethel’s newest book expands on the scope and sequence of higher education and the role of higher education in urban development. Athens of the New South: College Life and the Making of Modern Nashville, published in 2017 by the University of Tennessee Press. Digital Humanities is a still a relatively new field, not available when I was completing my PhD coursework, but the DH have always been of interest to me. It is for this reason that I remain grateful for the post-grad opportunity to gain meaningful training and experience through GMU and the RRCHNM. Meanwhile, my interest in Public History has long played a role in my educational and professional career. My goal for this semester is simple: to continue the work and experiential learning that began with HIST680. Let the work begin.